Aruba's clear waters are filled with reefs and shipwrecks that offer enough variety to keep divers busy from morning to night dive, with sites that range from snorkel-friendly shallows to critter-rich slopes and deep drops that edge into extended range territory. The island's signature wreck dives are for everyone, as these large and historic vessels lie in relatively shallow water close to a sheltering shore. Reefs are equally easy to reach, with many just a short boat ride away. Ashore, Aruba is one of the Caribbean's most cosmopolitan destinations, with upscale resorts, casinos, and a lively night life scene, but it also has a wilder side best explored by jeep or four-wheeler safaris. 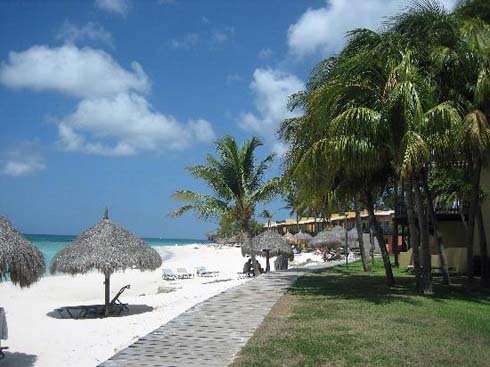 Aruba’s southern and western coasts are sheltered from prevailing trade winds and swells. Dry conditions mean no runoff to mar coastal visibility; currents range from non-existent to mild, and water temperatures range from 78-82° F. Reefs begin close to shore and slope to depths of more than 130 feet. Sand flats off the western coast are home to a number of significant wrecks—all located in clear, shallow to mid-range depths. Daily boat trips access all sites, and several can be reached from shore, making Aruba a destination suitable for divers of all experience levels. Many reefs begin shallow and run deep, so brush up on your multi-level diving skills and bring a computer. Those susceptible to motion sickness on the ocean will be pleased to know that west-coast sites are calm, and reefs along the central-southern coast tend to have calmer water and milder currents than those farther to the east. Water temperatures range from 78 to 82 degrees. The Antilla, Pedernales and Star Garren are the three must-do wrecks, and all are within the capabilities of competent open-water divers. Lobsters and green morays are abundant at Plonco Reef and Skalahein features rich growths of soft corals and a slope that is ideal for extended multi-level profiles. A favorite shore dive begins at Mangel Halto Beach. A light skin suit or 3-mm wetsuit is usually sufficient throughout the year, but an extra vest or beanie might be in order for second dives or in the months of April to June, when seasonal currents may bring cooler waters. Some shore dives begin on rocks, so sturdy-soled booties are in order. 7-NIGHT DIVE PACKAGE includes 7 nights King Efficiency accommodations, 5 days of 2-tank boat dives, free WiFi, roundtrip airport transfers, hotel tax and service charges. Valid 4/22/19-12/20/19. SAVE $100 PER ROOM includes 7 night studio accommodations, 5 days of 2-tank boat dives, free WiFi, roundtrip airport transfers, hotel tax and service charges. Valid 5/11/19-12/20/19. Book by 6/13/19. SPECIAL RATES SALE includes 7 night Superior accommodations, 5 days of 2-tank boat dives, free WiFi, , roundtrip airport transfers, hotel tax and service charges. Valid 4/23/19-5/22/19 & 5/27/19-8/31/19. Book by 4/30/19. 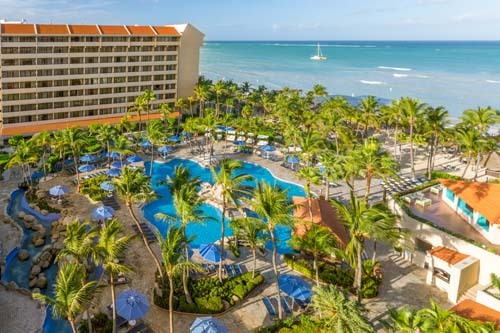 The Barceló Aruba transports guests to a unique beachfront experience in Palm Beach and is a stunning all-inclusive resort that also offers a boutique hotel with in the hotel, the Royal Level Barceló Aruba. Offering luxury and sophistication with unique and exclusive services. All 373 rooms feature a balcony providing spectacular views of the resort and Palm Beach. Relaxation waits for you at the expansive swimming pool or sunbathing in the splendid gardens. The hotel’s rich and diverse culinary offering will satisfy the hardest to please palates with international dishes, buffets, à la carte menus, and aperitifs, served in its 6 restaurants and 3 bars. 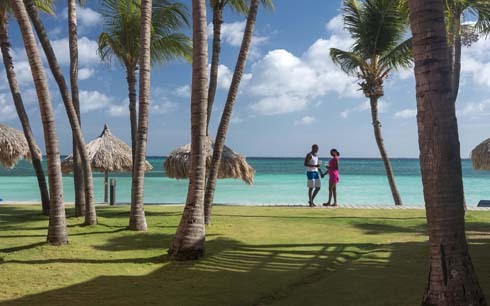 Entertainment is abundant with options for numerous sports and leisure activities at Barceló Aruba. 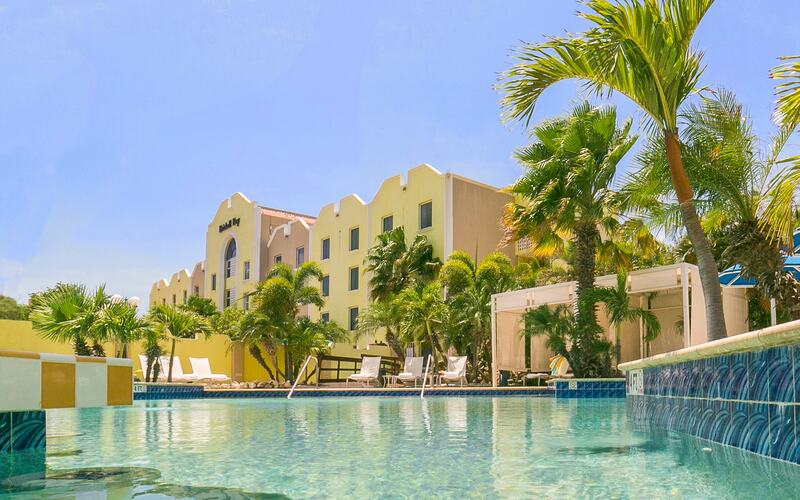 This tropical oasis of authentic Aruba hospitality is set amid the island’s Palm Beach high-rise and casino resorts. The palm-shaded pool is a tranquil getaway at the heart of the resort. Spacious rooms and suites, some with private hot tubs and most with a full kitchen, are just across the street from the beach with complimentary shuttle service. Diving with Unique Sports of Aruba. Brickell Bay Beach Club is located on the beautiful white sand beaches of Palm Beach. With only 98 rooms and suites, guests will enjoy a high level of personalized service and convenient amenities including onsite restaurants and bars, room service, complimentary breakfast and free WiFi. The resort is centrally located with a wide array of top-rated restaurants, casinos and live shows within easy walking distance. 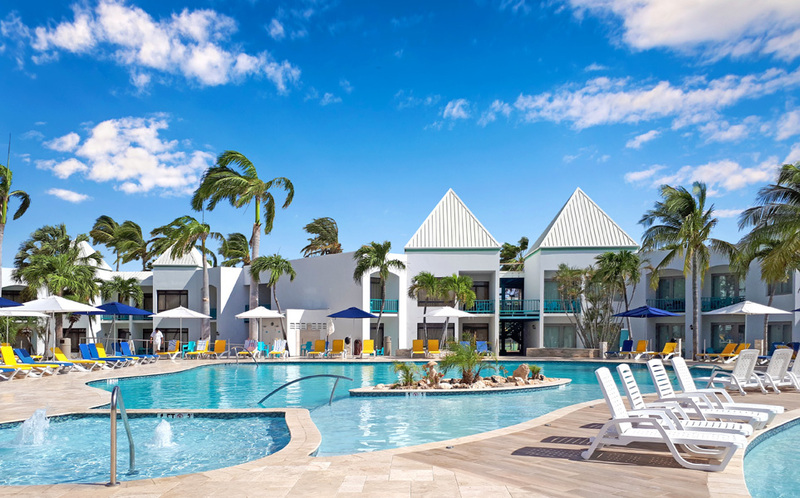 Nestled in a delightful tropical garden dotted with freshwater pools, the Divi Dutch Village Resort is an intimate all-suite resort in the Divi Aruba resort collection—a serene spot with oversized rooms and quiet escapes—perfect for families with all generations. Diving provided by S.E. Aruba Fly ‘n Dive. 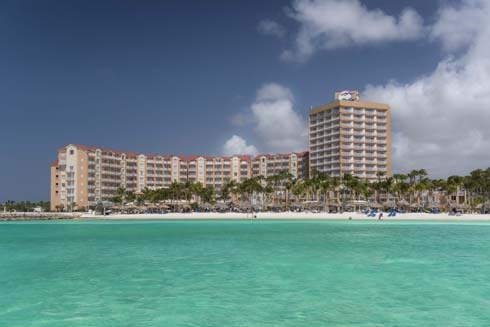 Situated on Aruba’s famed Palm Beach, the Aruba Phoenix Beach Resort offers spacious beachfront studio, one and two- bedroom suites with full kitchens, picture windows and private balconies. Additional amenities include three pools, fitness center, spa, casual and gourmet dining and swim-up bar. Scuba diving provided by S.E. Aruba Fly n Dive. 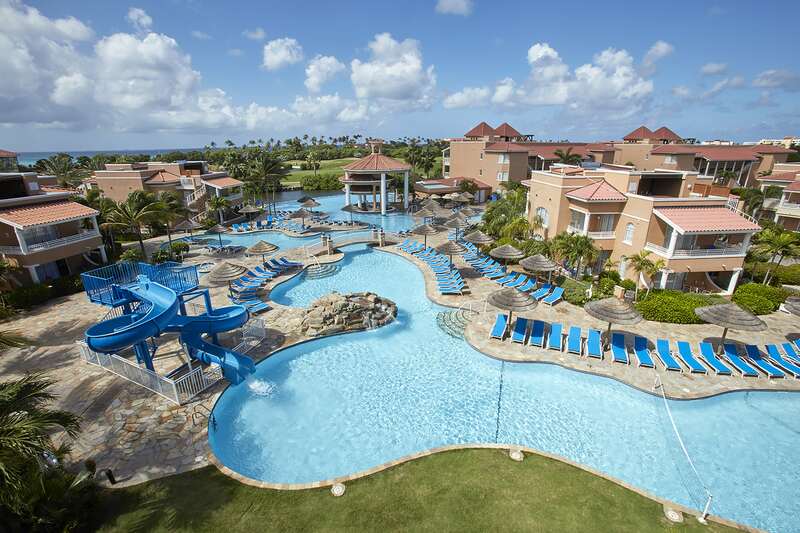 Steps from Aruba’s white sand beaches, the Divi Village Golf Resort offers three restaurants, three pools, tennis courts, oceanfront fitness center, rock climbing wall, and a featured Links golf course. The resort offers large studio and one or two bedroom suites with full kitchens. Free shuttle to nearby casino. Diving with S.E. Aruba Fly ‘n Dive. Aruba is home to a number of shipwrecks that are easy to explore, due to their moderate depths and benign water conditions. The sand-bottom plateau that lies off the island's western coast is the resting place of the Antilla, a 400-foot submarine supply ship from the WW II era. The ship went down in 1940 when the captain decided to scuttle his command rather that surrender to Dutch forces. The Antilla remains virtually intact, and after more than 70+ years on the seafloor, it’s covered in colorful corals and sponges and home to a range of marine life from eels to blue tangs and battalions of sergeant majors. It's worth several dives, just by itself. And, at a maximum of 60 feet, you can explore this wreck with ease. Not far away are the remains of the British-flagged tanker Pedernalis, which was torpedoed by a German submarine in 1942 while anchored just off the coast. Today, the wreck is scattered in several large pieces that serve as a haven for marine life. It's shallow depths make it ideal for novices and even snorkelers. A less-visited historic wreck is a wooden steamer California, which lies off the island's northwestern point. Though shallow, the wreck is best left to experienced diver due to waves and current. A number of purpose-sunk ships offer easier conditions. The literal star of the fleet is the 255-foot freighter Star Garren, which sits in 70 feet of calm water just off Palm Beach. Other favorites include the Jane Sea, a 250-foot cement freighter with gaping holes that attract rays and turtles, and the Debbie II, a 120-foot barge that was sunk in 1992, and since become heavily encrusted in bright corals. Also in the mix are a pair of sunken aircraft: a vintage DC-3 and a Corvair 400 that rests on a sloping reef surrounded by soft corals. Both offer penetration and provide unique photo opportunities. Wrecks aren't the only attraction, as Aruba's entire south coast is flanked by reefs that offer topographies ranging from gentle slopes to steep faces cut by crevices and overhangs. Gorgonians and other soft corals add splashes of color to reefs rich in collections of hard corals that include staghorn, elkhorn, brain, star and leaf formations. Coral growth at Sonesta Reef begins in just 15 feet of water, while at the other end of the spectrum, sites such as Skalahein Reef drop to 140-feet and feature groves of black corals and large deep-water gorgonians where keen-eyed divers may find seahorses hiding among the branches. Experienced divers can head to the island's eastern point and northern coast where the reward for more challenging conditions are massive boulder fields and giant sponges offshore of the collapsed Natural Bridge and the swirling schools of barracuda, amber jacks and rainbow runners that patrol Cabez Reef. The truly adventurous can arrange for a charter to Serito Pinnacle, which rises from open water several miles offshore. In all, there are more than 30 named sites visited by local operators, providing divers with a wide range of options from mild to slightly wild. Entry Requirements: The U.S. Department of State requires that all travelers to and from the Caribbean have a passport valid for at least 6 months from the date of return from the destination. U.S. and Canadian citizens do not need a visa. For more info visit the USDoS website. EXIT REQUIREMENTS: All persons leaving Aruba must pay a Government Departure Tax of approximately USD $37.50, which may be included in your ticket. No immunizations are required for travelers from the U.S., Canada or Great Britian. Check with your doctor and the Centers for Disease Control on recommended vaccinations for travel at CDC Aruba. For a prime example of Aruba's melting-pot society, try a local favorite: Keshi Yena. Made from a hollowed-out sphere of Edam cheese filled with local meats, vegetables and island spices, it combines Dutch, Spanish, and African influences into a soothingly savory yet slightly spicy mix. Ditto for island culture. Dutch is the official language, but school children also learn Spanish and English, and you may hear the lilting tones of Papiamento, which is a local mash-up that borrows from all three and adds a bit of Portuguese and French, finished off with Arawak Indian and African influences. There's still plenty of Dutch practicality in the Aruban character, but this is also an island that likes a party. Carnival, locally called Bacchanalia, takes over the island from January through the Tuesday before Ash Wednesday. Aruba is also the only country to celebrates Dia Di San Juan with singing and dancing, and the New Year celebration known as Dandee has its roots in the Papiamento word for carousing. Aruban's love music, and the local beat, called socarengue, is accompanied with a sensual dance. Aruba's country code is 297 and direct dial service is reliable. Check with your cell phone service provider for information on calling and data usage in Aruba. High-speed internet service is readily available. Desalinated, filtered tap water is safe to drink. Bottled water is readily available for sale. Dutch is the official language of Aruba. English and Spanish are widely spoken. Aruba is in the Atlantic Time Zone (AST) and does not observe Daylight Savings Time. Aruba is four hours behind Greenwich Mean Time (-4 GMT). Aruba is 21 miles long and 6 miles wide, a total of about 75 square miles. Aruba is one of the Lesser Antilles located below the hurricane belt in the Southernmost end of the Caribbean roughly 18 miles off the coast of Venezuela. The population of Aruba is approximately 104,263 (2016).